D.A. Carson has written a helpful little book that will be of interest to pastors, missionaries, Bible students and aspiring theologians. This book was originally given as a short lecture series delivered at Reformed Theological Seminary, then repeated at Westminster Theological Seminary and Colloque Réformée held in Lyon, France. It is a helpful albeit brief examination of the title Son of God and its relationship to Christology. As we would expect from Dr. Carson it is a model of solid exegesis in order to address pressing theological issues. 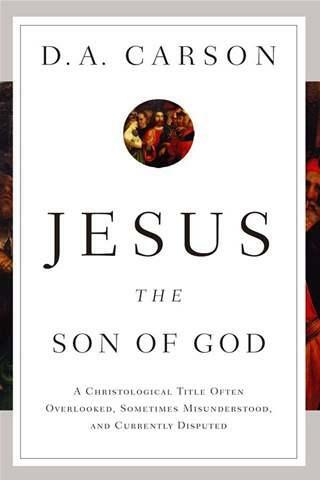 The first chapter is an examination of the title “Son of God” as a christological title. In this brief lecture Carson gives us a scope of the varied uses of the idiom ‘son of’ and how it is translated into English. Here he quickly condenses a lot of Biblical data into general categories. His larger point is that the phrase “son of” is more than a reference to genetic and familial identity as often limited in the English usage of such a phrase. This data is placed into two helpful charts on pages 21 and 23-24. This discussion lays the groundwork for discussing how “Son of God” itself is used a title in various ways in some cases referring to angels, Israel, the Davidic King and New Testament believers. Anyone familiar with the Biblical data and the Biblical semantics will already be abreast with this treatment. Nevertheless, this work gives one a general survey and could serve as an introduction to the topic. Chapter one concludes with a brief reference to the unique use of the title Son of God, which will build into the next chapter. Chapter two is a treatment of select ‘Son of God’ passages as it relates to Christ. The bulk of the chapter is spent in Hebrews 1 and John 5:16-30. Along the way, Carson will drop hints of what his argument would look like if sketched out in the Gospels and other New Testament books. Carson clearly shows how the title ‘Son of God’ as a Davidic reference comes together with a clear reference to deity. So for example, in Hebrews 1, Son of God clearly has a Davidic referent--that Jesus is the Messiah. But the flow of the passage and the use of the Old Testament clearly identifies Jesus as God. Thus, sonship language referring to Jesus “cannot be restricted to a strictly Davidic-messianic horizon” (59). This is not a novel thesis to those familiar with Biblical studies. However, Carson’s work serves as a healthy introduction to the issues. Chapter 2 ends with a briefer discussion of John 5:16-30. Carson argues that 5:26 where the Father grants the quality of life-in-himself is an eternal grant from the Father to the Son. This sets some exegetical grounds for what becomes known in historical theology as ‘the eternal generation of the Son.’ It is in this discussion, to which Carson will return in the third chapter, that Carson models the connection between exegesis and systematic theology. This modeling will serve students, pastors and even Biblical scholars adverse to making systematizing claims. In the final chapter, Carson turns his attention to the theological use of the title ‘Son of God’ to tackle a pressing missiological issue that has arisen. In recent years, some Bible translators have suggested that in Muslim contexts the title ‘Son of God’ should not be translated as such because of the potential misunderstanding. Depending on the verse, these translators often suggest a title that emphasizes Jesus’ messianic identity. While the Christian title ‘Son of God’ has never meant God the Father produced a son in union with Mary, seeking to avoid the title to correct this misunderstanding will lead to misunderstandings of its own. Carson draws out the pitfalls and reductionism such translation creates. Carson argues that one cannot reduce a translation of ‘Son of God’ to messianic identity precisely because the New Testament especially in Hebrews 1 uses Messianic identity together with divine identity. In one chapter we have “two analytically differentiable uses of ‘Son’ terminology” (p.106). Overall, there is a lot of content back in this short book. It is a solid argument that moves along. Readers unfamiliar with the issues will receive a good introduction. The only criticism of this work that I would offer is its brevity. At times I found myself wishing that certain points could be developed more or that certain areas or works of scholarship could receive interaction. Along the way, Carson himself drops hints of what we be needed to fully defend his case or what other twists and turns the argument could take. One would hope that perhaps Carson would consider expanding this work into a full blown scholarly monograph. This is not to take away from the strength of what he has produced. I would highly recommend picking up this work and reading it. I wish to thank Crossway books for providing a review copy of this work. A favorable review was not a condition of review.